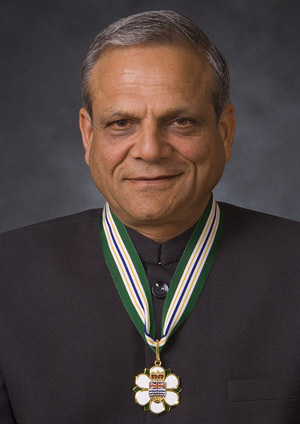 A highly respected member of British Columbia’s South Asian community, Sudarshan Bakshi is widely known for his community leadership and volunteer service. Following his arrival in Canada in 1967, Mr. Bakshi worked as a forklift operator and operated his own small blueberry farm for many years. As the father of five daughters, he decided to help young women in Canada and India. In 1988 he began sending money to Indian charities to help poor young women and families struggling to deal with the dowry system and helped young women learn skills like needle-work and sewing that would make them financial contributors within their family units. By the 1990s, Mr. Bakshi took his charitable efforts to the lumber mill where he worked, organizing a charity lunch to benefit BC’s Children’s Hospital. Success led him to found the Janta Sewal Society, dedicated to assisting under-funded charities. Through this society, he has raised more than $400,000, supporting a range of charities, including the Canadian Red Cross, Delta Hospital Foundation, Canadian Cancer Society, and many others. Mr. Bakshi has continually identified new causes and new fundraising ideas. He is a founding member of the Five Rivers Community Services Society, the largest funeral home in Canada. He has also worked to increase understanding and tolerance between cultural groups. He is a founding member of the South Asian Human Rights Organization, which works to build bridges between various factions, religions and countries. Mr. Bakshi’s leadership, volunteerism and hard work have enhanced the quality of life for many people in British Columbia and India. He is a working person who has spent every spare penny and minute helping others and working toward a united community.